I hope you all had a great Thanksgiving and Black Friday! 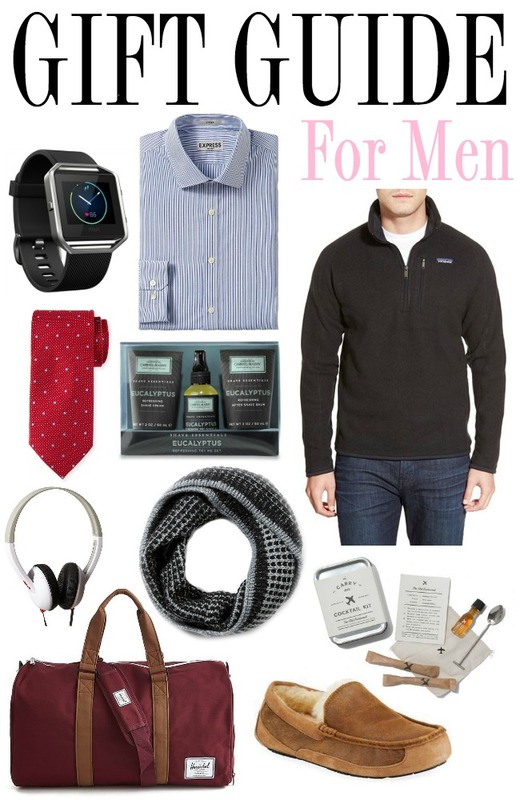 I've put together another gift guide this week, this time for the guy in your life! I was really tempted to put in a pair of black socks, because that's literally what my dad and sister's boyfriend asked for this year, but they didn't make the cut. I think my favorite items here are the Carry on Cocktail Kit (how unique!) and the slippers. Both will be perfect for any holiday travels! What are you getting the men in your life? These are all great ideas! I'm doing a little care package filled with all the things my boyfriend definitely needs but doesn't realize he needs haha. I'm excited! What an awesome gift guide! I got my husband a duffel last year and it was a life changer for him! I love hershel! They make a lot of nice items that work perfectly as gifts. Great suggestions! I love the scarf. Oh I love these! I got my hubby a herschel bag for his birthday actually! I think my dad would love those cozy slippers- might have to look into those! This is such a great gift guide! Men are absolutely impossible to shop for, and this is so helpful!